Using the heating power from the heat pump it is three times more efficient than a standard Hot water cylinder therefore saving up to 60% on your hot water electricity bill. The system produces less noise than a standard domestic heat pump and unlike the solar hot water system it operates day and night and no unsightly solar collectors. Split system where the heat pump is separate from the system, this give the option of the cylinder been located inside with the heat installed out side. The tank can be either Stainless steel or standard mid steel cylinders. 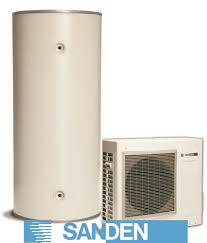 Combine system: the heat pump is install on top of the cylinder and comes as one unite.